Text & Photographs By Jerry Reber © All rights reserved. When you visit the Grand Canyon, there are two choices: the South Rim or the North Rim. 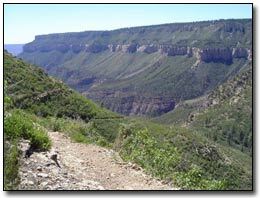 Here is a hike on the North Rim, the exciting Powell Plateau. Wow! What a great experience! It was a challenge, though. Powell Plateau is a backcountry "ship" or island in the Grand Canyon National Park. Well worth the effort! 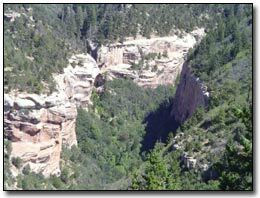 It starts at the Bass Trail Head located in the remote backcountry of the North Rim. This trail head is 18 miles drive by high clearance vehicle. The last 6 miles took me 45 minutes to cover. Very rocky deep ruts. Once there, I looked from the overlook at Swamp Point over to Powell Plateau and wished that I had more sleep last night. The trail head to Powell Plateau begins at the west tip/end of Swamp Ridge. The North Bass Trail descends 900 ft through very good limestone switchbacks to a saddle called the MUAV Saddle. There is little or no vegetation on the descent from Swamp point due to repeated forest fires in the area. The view from the trailhead is average, at best for a Grand Canyon view. You start to really appreciate the views as you begin your descent. Much of the Grand Canyon views to the South toward the Colorado River are somewhat obscured at the trailhead. Halfway down, you will see a canyon with sheer white rocks coming in from the east. To the north, you will see the forested Kaibab north rim and an Island of huge rock (steamboat mountain) up Saddle Canyon. To the south, is the North Bass trail as it follows the drainage 14 miles to the Colorado River. The MUAV Saddle is directly below you; bridging you to the Powell Plateau which stands like a large ship directly in front of you to the west. Once on the MUAV Saddle, look for an historic cabin built by park service in 1920's. Once on the saddle, the trail splits and heads three directions. Don't be alarmed by this posting. It is quite obvious you will be going due west and immediately begin to climb the Powell Plateau through a great trail that takes you up a hillside covered with bushes and dotted with evergreens. The other splits take you to the cabin which sets a few hundred feet to the north, and the fork going to the east side, immediately drops down a steep slope and becomes the North Bass Trail which takes you south to the Colorado River around 14 miles away. If you take the north trail to the cabin, you can also find a trail that takes you up the Saddle Canyon to Steamboat Mountain. So, once you have traversed the saddle, you are now ascending the Powell Plateau as you are heading northeast. the ascent is 800 ft to the highest point on Powell Plateau. Once on top, the plateau is very user friendly. There are many choices. You can head out in a northeasterly direction through the forest to an overlook of the Colorado River and the beautiful canyons as they gouge their way westward. There is no trail for this overlook. The overlook is marked with cairns and is located at GPS: N 36 degrees 20.593 W 112 degrees 22.889 elevation: 7568 ft. This is a rare opportunity to see the canyon formations looking to the west. Remember, you are not on a north rim looking south or a south rim looking north. 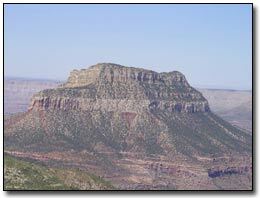 Here, you are looking directly off of Powell Plateau on its western cliff facing. I would recommend doing this lookout first in the morning or when the sun is directly overhead. That way, you are not looking into the sun and the full view of the canyons would be optimal. Next, head back to where you first came up the trail to the plateau and you will notice a faint, but well travelled trail which was built by the CCC during the Depression. The trail is fun, and blazed with painted metal triangles nailed to trees every few hundred feet or so. Many fires on the plateau have since removed many of the blazed trees. The trail is fun to travel. It is relatively flat and little elevation gain. You did all that on the way over here! At approximately 1.1 miles into the trail, keep to the left or eastern facing and you will come to a spectacular viewpoint. the GPS for it is: N 36 degrees 19.231 and W 112 degrees 22.278 elevation 7694 ft. From here, you can look at the trail head and see where you parked your vehicle. The valley below is spectacular! The views to the east and southeast are amazing! This particular hike with these two viewpoints allowing for lunch, lots of picture taking, took me 8 hours total time. This is about all I recommend for a day hike. Remember, you must once again descend Powell Plateau 800 ft to MUAV Saddle and ascend the switchback 900 ft up to the trailhead and your vehicle. Conserve your energy. If you are interested, you can obtain a backcountry permit at the Grand Canyon for overnight camping and camp on the plateau under the stars and spend several nights and days exploring the entire plateau. I can only imagine what views there are in all directions once you explore the entire 8 mile pie crust perimeter. The final viewpoint that lies on the south end of the Powell Plateau, five miles in, is called Wheeler point. Dutton Point is also along the way. I understand that a hike around the entire plateau and back may take up to 17 hours. So, please plan accordingly. I would highly recommend that this trip be an intimate, overnighter or multi day trip. 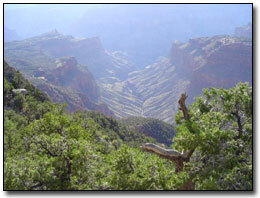 You would be exploring the Grand Canyon at one of the most spectacular places with little or no tourist activity. Travel 26 miles south of Jacob Lake on Arizona hwy 67 just past the Kaibab Lodge and DeMotte Park. Turn right, (west) onto a great dirt road, forest # 22. Drive 2 miles then turn sharply left, (south) hard left... onto forest #270. Drive 2 more miles and turn right onto forest # 223. Drive 5.3 miles to forest # 268. This is a hard right and easy to fly by. Turn left onto #268 and continue about .2 tenths of a mile to forest # 268-B. Bear left at the fork (there is a small pond on your right) and continue 1 mile to the national park boundary. You will see a large sign and a gate welcoming you to the Grand Canyon. Drive into the park and proceed .1 tenth of a mile and turn right (west) onto a rough double track road (Swamp Point Rd). Continue west on this road with deep ruts for 6.9 miles to Swamp Point and North Bass Trail head. Note, high clearance is recommended. It took me 45 minutes to travel this last 6.9 miles. Not real bad, just a slow, winding, forest road. Very scenic. 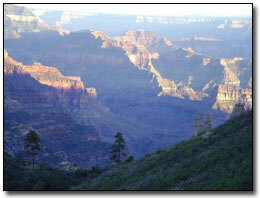 Hope you have a great time hiking Powell Plateau on the north rim of the Grand Canyon National Park.